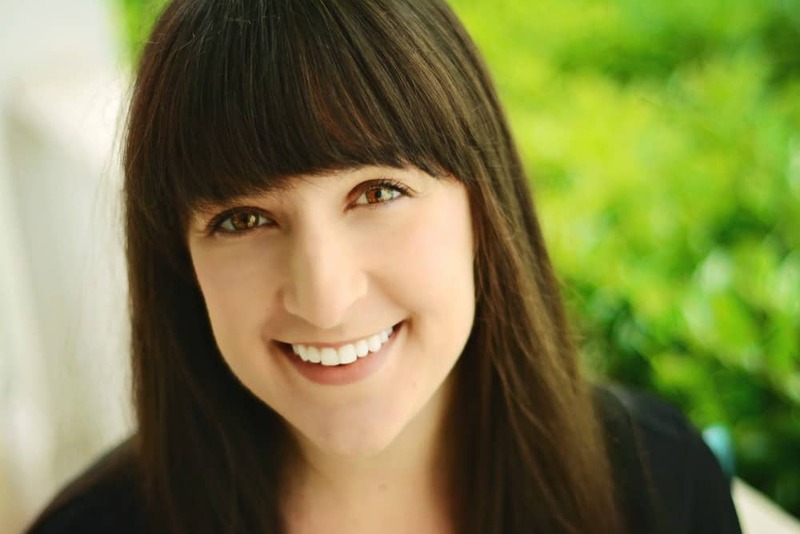 February 27, 2017 By Liz 52 Comments Note: This post may contain affiliate links. As a vegetarian, beans are a regular part of my diet. Garbanzo beans, cannellini beans, navy beans, kidney beans… and of course, black beans. I love that they’re packed with protein and fiber and they’re just so versatile. Tacos, soup… brownies. If you haven’t gotten on board the bean-brownie trend, I’m here to tell you that you’re missing out. I’ve made a few different versions and these are my favorite. They even got a thumbs up from Alex, before and after he knew what was in them. The best part is, you can whip them all up in a food processor so you only have one thing to clean! Also, I’d recommend not using muffin liners because these brownies actually tend to shrink up just a bit, which is how you can tell when they’re finished cooking. Don’t worry, if your spray your pan with a little non-stick spray, they’ll pop right out. Make sure you melt the coconut oil before adding. Be sure to blend the batter very well before you stir in the chocolate chips. You don’t want lots of bean chunks! It doesn’t have to be completely smooth, but you shouldn’t have any large lumps. 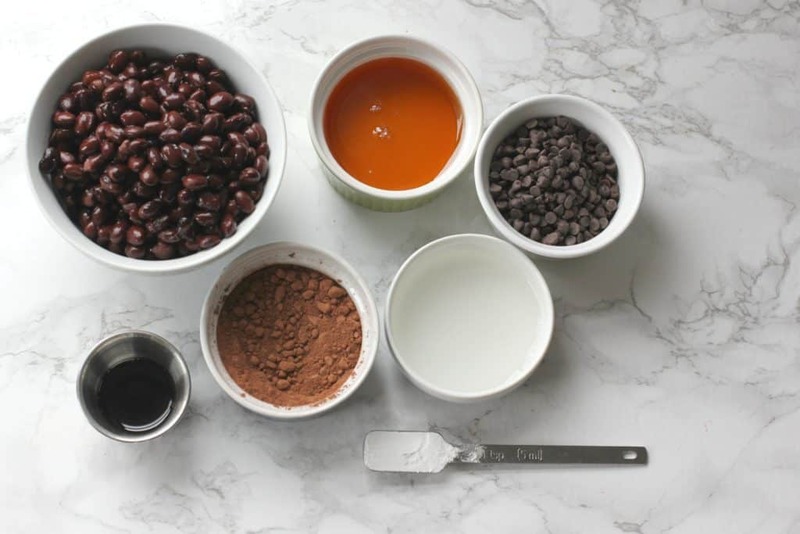 Test the temperature of the batter before adding the chocolate chips. Sometimes blending in the food processor will heat up the batter so much that it could melt the chocolate chips. You may have to let it cool down for a few minutes before adding the chocolate chips. Do NOT overbake! Test with a toothpick and make sure you remove them when the toothpick comes out clean. If you over bake them, they’ll dry out. 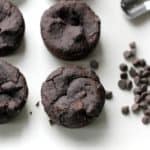 These black bean brownie bites are vegan and gluten free. They’re low in sugar but high in protein and fiber. They’re an easy, healthy dessert! Combine all ingredient except for chocolate chips in a food processor. Blend on high until the batter is almost completely smooth. Spray a mini muffin pan with non-stick spray and scoop 1 1/2 tablespoons of batter into each muffin tin. It should make between 16-18 mini muffin cups. Bake for 20 minutes or until the brownies begin to pull away from the sides of the pan just slightly. Do not over bake! Let cool completely before removing them from the pan. Make sure your batter is almost completely smooth before you stir in the chocolate chips! These are vegan & gluten free, and thanks to the beans, they actually have a little protein and fiber. 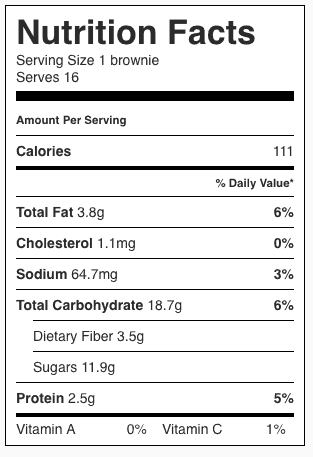 Click here for the full nutritional information. This recipe made about 16 mini brownie bites. Normally, I think cookie > brownie, but these could sway me. They have the bite-sized nature of a cookie and you still get little chunks of chocolate in there, like my favorite chocolate chip cookie. Trust me, these little bites won’t last long! Are you a brownie person or a cookie person? Pinning this recipe! I love black bean based desserts, esp brownies! I’ve always wanted to try cooking or baking with black beans but I never have. These look simple and easy. I would have never thought to put beans in brownies, but now I really want to try this!! i have a health fair coming up and i was looking for healthier brownie recipe, maybe i will try this out! 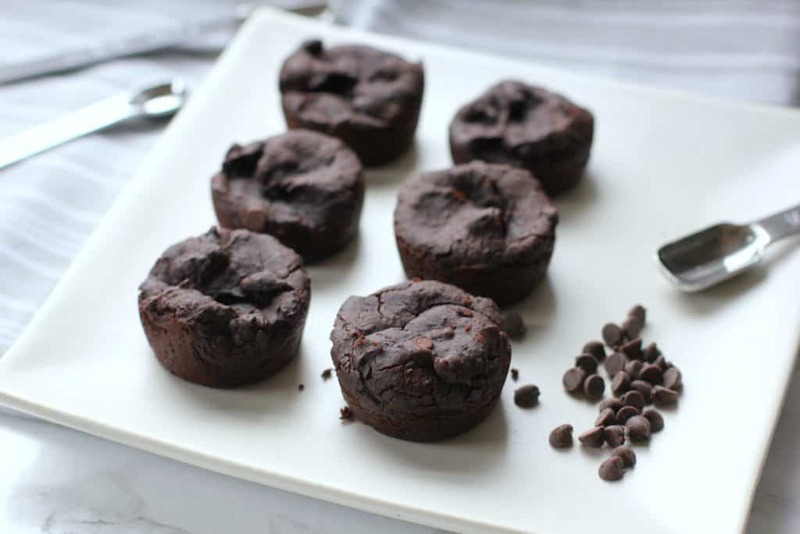 I haven’t got on board with the black bean brownie trend, but I need to as these look so rich and delicious!!! I love every bean/pulse I’ve ever tried, so I just know I would love these! Oh my. I have got to try this recipe. I love black beans and I know the craze of putting them in brownies has been around, I have yet to do it. Thanks for the reminder! I’ve tried black bean brownies and they’re amazing. I can’t wait to try your version. Yum! Whaat? Black beans in brownies?I must try this. The last time I bought black beans I had no idea what to do with them. Thanks for the inspiration! Oh yes please! I just had a insta friend post she was making black bean brownies but no recipe! This is gonna have to happen tonight when I get home! I haven’t tried black bean brownies yet but these look amazing! I love brownies! So fun that these are little bites! They look so yummy. My kids LOVE chocolate, I will have to make these for them. I love that they’re secretly healthy too! These look great! And look like a wonderful healthy option. I LOVE putting black beans in brownies; it’s so easy to disguise them with the chocolate color. And they make them so moist and dense. I love how incredibly simple this recipe is! And those brownies look so fudgey – just perfect!! YUM!! Imagine my excitement when I realized that I had everything I needed in my kitchen to make these today! Pinned. I’ve never heard of black beans in brownies, but yours look delicious! I’m tempted to try the recipe! I keep hearing how good this can be but I haven’t tried it yet. Do you think my kids would notice? I am giving this a try for sure because they look so rich and chocolatey. This is fascinating, is there anything beans can’t do? I just bought pasta made entirely out of beans, and it’s great! Blowing my mind here! No flour? No sugar? Healthy? I’m impressed! I’m really curious about these and how they taste. Might have to give them a try! I’m glad you liked them! I love the topping ideas!! Hi LIZ!!! I’m so happy to see you still blogging! I used to blog WAY back in the day at Moves N Munchies, but I’m back with a different blog now! You are killing it!! Also, super intrigued by these bites. I once tried to make black bean brownies and they well, totally failed. That was a while ago, so I want to give them a try again! What a clever idea! I would have never thought to use beans for brownies and I bet no one would know. Yummy! 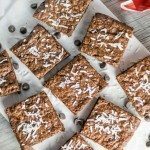 I haven’t jumped on the black bean brownie bandwagon yet as I have been enjoying simple flourless brownies – but I do so love adding a good boost of veggies into ma treats and definitely need to jump on the BBB bandwagon pronto! I’m loving the black bean brownie trend! I must try these! I’m intrigued enough to give these a go – thanks for sharing! This is my favourite recipe for brownies so far, Liz! I love healthy and finger-licking treat! 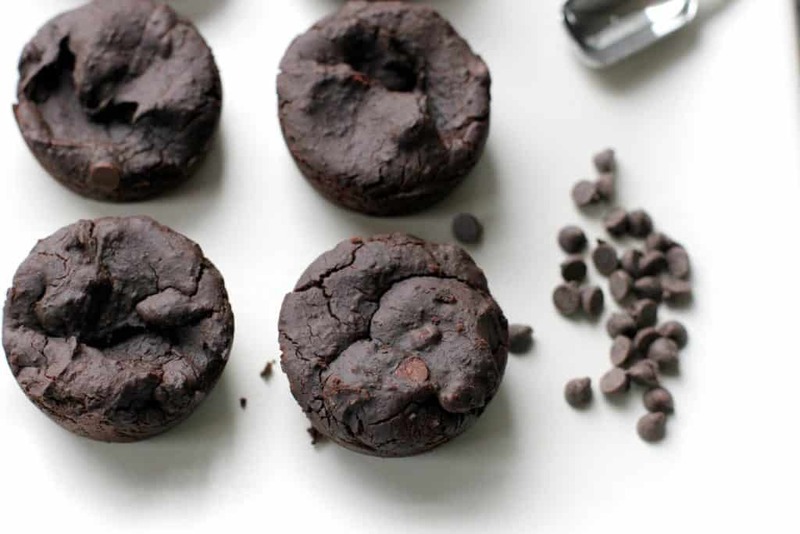 I have yet to try black bean brownies, but you have me really tempted with these! 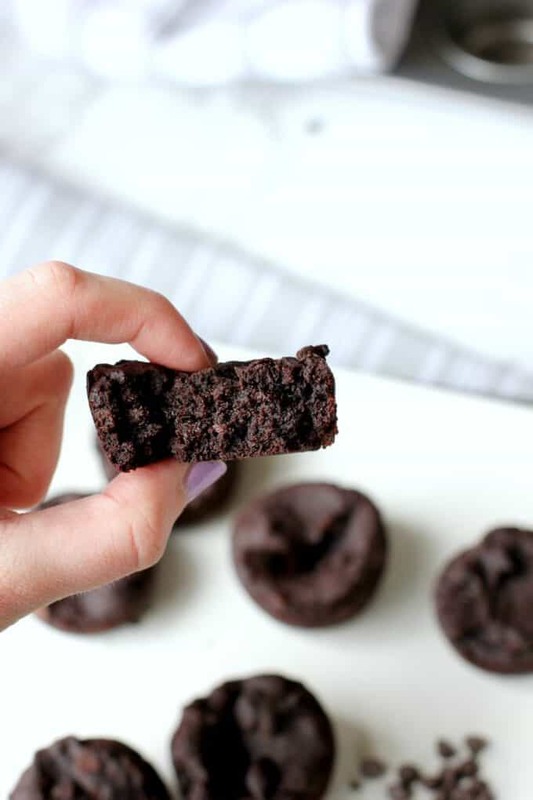 I have heard that black beans actually make brownies taste delicious but I haven’t tried them yet… I think I need to soon because these brownie bites looks amazing! Wow, so there is no flour in them? That is so tricky. love it! I guess I have never actually read a recipe for black bean brownies and always assumed that they were regular brownies plus pureed black beans. Now I see the allure. They are so much healthier! I’m generally a cookie person, but these brownies would probably win be over! Believe it or not, I’ve never actually made black bean brownies yet. But I’ve made brownies with aduki beans and they turned out great, so I’m excited to give these a go! I made he brownies today but they didn’t stay together at all. What have I done wrong? Delicious mistake though! This is just the BEST recipe!!! My kids demolish these with no idea that they are actually eating something healthy! 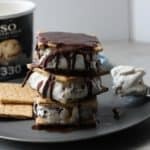 Wow, I have bookmarked this recipe, can’t way to try them!! I also see things like dark or light cocoa powder mentioned in some recipes……I don’t understand what it is, when you go to the store here there is only 1 type of cocoa powder. LOVING the ingredients here as it’s all stuff I keep on hand! Fabulous! Yes!! I hate when people are so weirded out by beans in brownies, cookies, etc. because they’re so good and most people probably wouldn’t even notice if you didn’t tell them 🙂 I could eat a million of these! 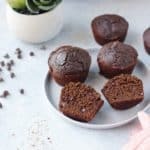 Can I make this recipe in a normal brownie pan (as opposed to muffin tins)? They look great!! I am a health nut (holistic nutritionist) and don’t normally make baked goods for my kids. These have no terrible ingredients and the oil is low so I approve. I used maple syrup as that’s what I had. I didn’t add any chocolate chips and they were amazing! My kids ages 3 and 5 love them and think they are getting a “treat”. Brownies for my kids, brownie points for mom! Thanks for posting! After using MyFitnessPal to construct this recipe with the actual products I used I got 19 brownie bites at 106 calories each which still isn’t bad for dessert! The batter was yummy and I loved that I could use my food processor to make this! The bites are still in the oven but are looking awesome! Yay! I hope you enjoy them, Kelly! Can I use regular vegetable oil? And would they hold up as cookies or does it have to be a brownie? I think vegetable oil would be fine! 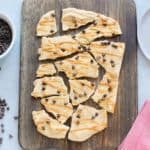 I haven’t tried these as cookies but if you try it, let me know!